This week I’ve got the last of this season’s butternut squash. After this any of the stuff you see around is most likely to be from another hemisphere. I love butternut but not enough to have it make a journey from Argentina. 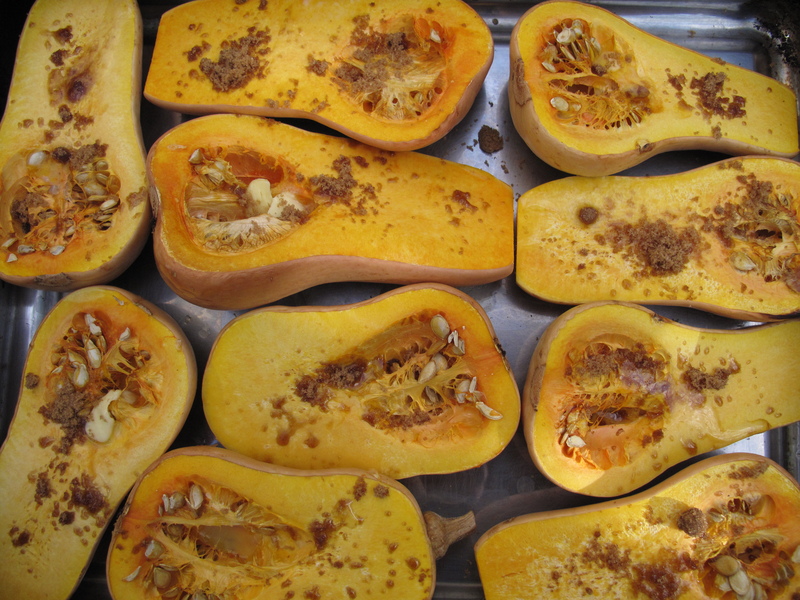 If you haven’t cooked it before, butternut squash makes all kinds of wonderful soups, gratins and stews. It’s also great served on its own (roasted, boiled, steamed or fried) then dressed with a little sea salt, olive oil and the tiniest dash of balsamic vinegar. Flavourwise, its earthy and quite sweet (which makes it a great weaning food for babies) and goes very well with garlic, leeks, onions, potatoes, chiles, maple syrup, brown sugar, cinnamon, nutmeg, parsley, sage and orange. Most recipes call for just the flesh and getting the skin off does look daunting but it’s not really. I find the best way is to quarter it first and then peel. After that, take out the seeds and stringy bits and cut the flesh as required. And what a lot of people don’t know is if you roast your butternut the skin ends up soft enough to eat which makes things even easier. 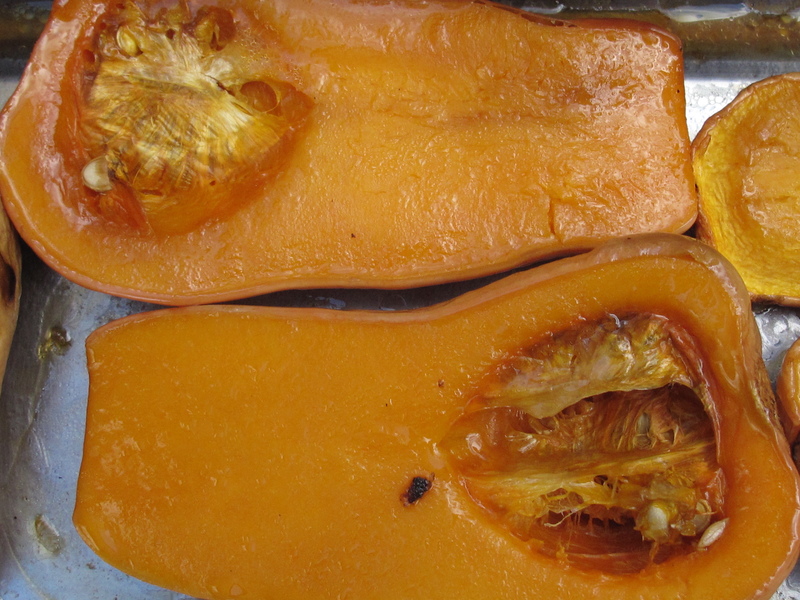 One of the simplest ways to cook butternut comes from a friend who reckons she got the recipe in New Zealand.You basically cut your butternut in half and stick in the oven so it really couldn’t be less labour intensive…..
Clean the skin and cut the butternut in half, then roast it softside up for 20 minutes. Turn it over and smear the flesh with butter, brown sugar, a generous pinch of sea salt and either a pinch of cinnamon or chili. Return to the oven and roast for a further 30 to 40 minutes depending on the size of your squash or until the flash has caramelised. 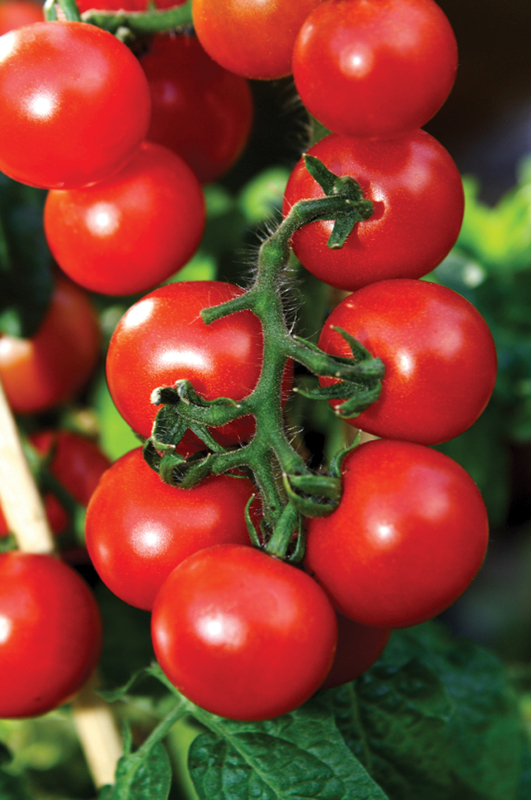 This is fantastic served with lamb, pork or some baked feta cheese with a cous cous salad dressed with olive oil, toasted pine nuts and plenty of chopped rocket or flatleaf parsley. 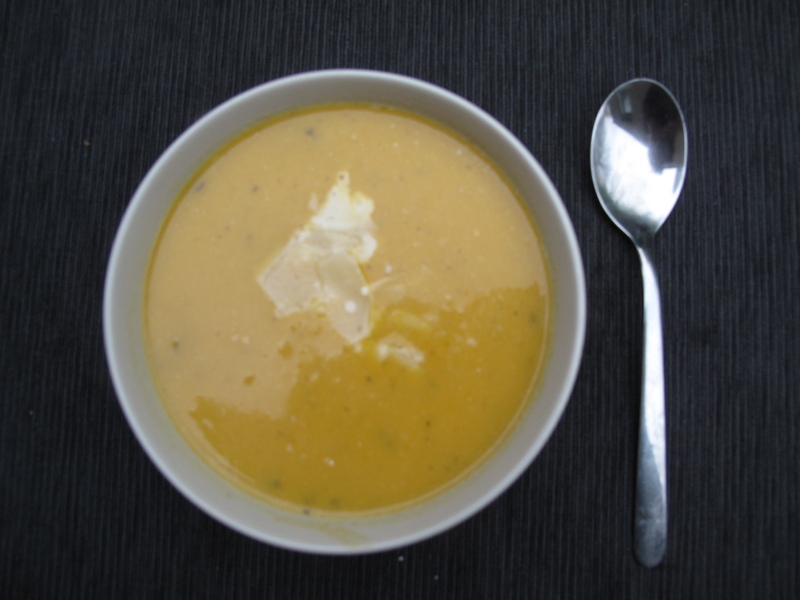 With the weather so horrible it had to be soup today and I made one of my favourites – butternut, with Parmesan and thyme. It’s quite a simple recipe but it gives knockout results. I’ve served it on Christmas day it’s that good. The sharp salty tang of the cheese combines with the thyme to give an almost meaty flavour that’s incredibly moreish. There’s a little cream in there too which means it’s nicely filling aswell. Heat the olive oil in a pot over a lowish heat then very gently sweat the butternut for about 5 minutes then add the onion, garlic and thyme. Continue cooking gently for another 10 minutes. Turn up the heat a little and add the vegetable stock in 3 stages stirring well between each addition. Bring everything to the boil then reduce to a gentle simmer, season with salt and pepper then cover and continue cooking for a further 25 minutes. To finish the soup off add 2 tablespoons of double cream and the grated Parmesan. Check and correct the seasoning if necessary then cook for a further 5 minutes. Remove from the heat and allow to cool slightly before blending until smooth adding a little more stock if necessary to get the consistency you want. Before serving reheat and garnish with a drizzle of sour cream if you have it and some Parmesan shavings. Don’t forget that soup freezes really well so it’s worth making a double or triple quantity you can use spuds and/or carrots to make up any shortfall on the butternut front. This week we have the start of Autumn varieties – Butternut Squash and New Parsnips. Seems unfair given we haven’t really had a summer but I suppose there’s always September (we Irish never give up the faith). This week’s recipe is a salad with Butternut Squash and Rocket. If you haven’t had it before, Butternut can be boiled, steamed or roasted (there are several recipes already on the blog including a really amazing soup). When you roast Butternut it caramelises on the outside adding great flavour. Then I added some toasted Pine nuts and a little Goat’s Cheese. Perfect for a Saturday lunch……. Begin by preparing the Butternut. I find the best way is to quarter it remove the seeds and stringy bits and then chop it up.Put the Butternut on a roasting tray and with your hands smear about 1 tablespoon of Olive Oil on them then roast in a hottish oven (Gas mark 6 or 200 degrees) for about 30- 40 minutes or until the pieces are soft and starting to caramelize. The tiny plums in your bag this week are Mirabelles and they’re only around for a couple of weeks every year. Completely delicious, they should be eaten asap and there’s no need to add anything – Yum!!!! This week sees the return of Butternut Squash which can be used to make all kinds of wonderful soups, gratins and stews. It’s also great served on its own (roasted, boiled, steamed or fried) then dressed with a little Sea Salt, Olive Oil and the tiniest dash of Balsamic Vinegar. Flavourwise, it’s earthy and quite sweet (which makes it a great weaning food for babies) and goes very well with Garlic, Leeks, Onions, Potatoes, Chiles, Maple Syrup, Brown Sugar, Cinnamon, Nutmeg, Parsley, Sage and Orange. Most recipes call for just the flesh and getting the skin off does look daunting but it’s not really. I find the best way is to quarter it first and then peel. After that, take out the seeds and stringy bits and cut the flesh as required. And what a lot of people don’t know is if you roast your Butternut the skin ends up soft enough to eat which makes things even easier. Clean the skin and cut the Butternut in half, then roast it softside up for 20 minutes. Turn it over and smear the flesh with Butter, Brown Sugar, a generous pinch of Sea Salt and either a pinch of Cinnamon or Chili. Return to the oven and roast for a further 30 to 40 minutes depending on the size of your Squash or until the flash has caramelised. This is fantastic served with Lamb, Pork or some baked Feta Cheese with a cous cous salad dressed with Olive Oil, toasted Pinenuts and plenty of chopped Rocket or Flatleaf Parsley. Heat the Olive Oil in a pot over a lowish heat then very gently sweat the Butternut for about 5 minutes before adding the Onion, Garlic and Thyme. Continue cooking gently for another 10 minutes. Turn up the heat a little and add the vegetable stock in 3 stages stirring well between each addition. Bring everything to the boil then reduce to a gentle simmer, season with Salt and Pepper then cover and continue cooking for a further 25 minutes. To finish the soup off add 2 Tablespoons of double Cream and 3 Tablespoons of grated Parmesan. Check and correct the seasoning if necessary then cook for a further 5 minutes. Remove from the heat and allow to cool slightly before blending until smooth adding a little more stock if necessary to get the consistency you want. Before serving reheat and garnish with a drizzle of Sour Cream if you have it and some Parmesan Shavings. Don’t forget that soup freezes really well so it’s worth making a double or triple quantity (use Spuds and/or Carrots to make up any shortfall on the Butternut front). Freeze in individual portions and then you’ll be able to bring it to work where you’ll go straight to the top of the recession chic charts! Roasted Butternut Squash is great in salads and this recipe is a meal in itself…. Roasted Pumpkin or Sunflower seeds if you have them. 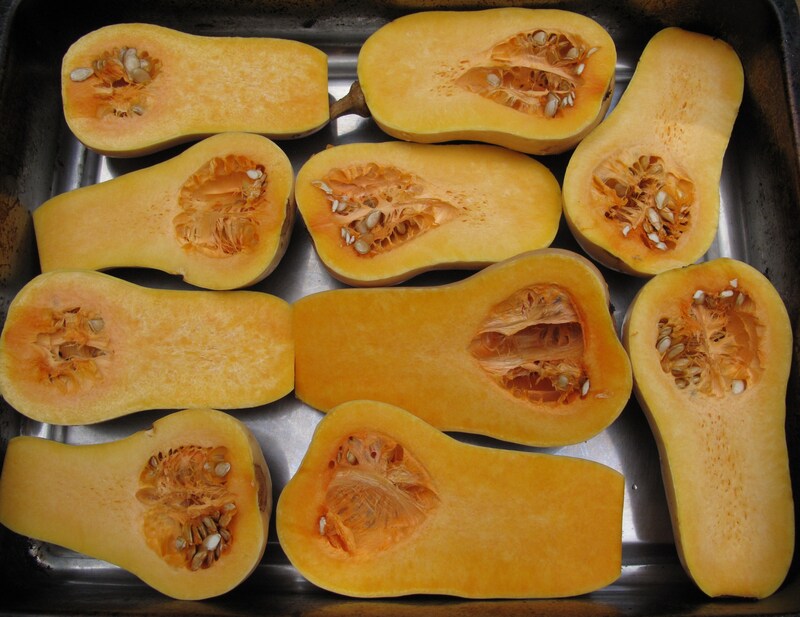 Put the Butternut on a roasting tray and with your hands smear about 1 tablespoon of Olive Oil on them then roast in a hottish oven (Gas mark 6 or 200 degrees) for about 30 minutes or until the pieces are soft and starting to caramelise. If you’d like a bit of a kick you can add a little finely chopped dried Chili to the Butternut before roasting. While the Butternut is roasting prepare the Cous Cous. Most recipes suggest steaming Cous Cous or sitting it boiling water but I learnt a technique from a chef in Barcelona which I reckon works better than anything. Basically you roast the grains on a dry pan as you would seeds and when they start to turn golden brown you turn down the heat, add hot water and stir like mad until the grains have softened and the water is absorbed. After that, turn off the heat and continue stirring so the grains don’t all clump together adding a little Olive Oil. As the Cous Cous starts to cool down you can stir it less and get on with preparing the rest of your ingredients. This recipe calls for 200gr Cous Cous which is about 1 1/4 cups and I’d reckon on adding about 2 cups of water but it’s not an exact science. If you find that the water has evaporated before the grains are cooked add a little more and if you find there’s still water in the pan and the grains are cooked turn up the heat and and stir everything so the excess water evaporates as quickly as possible. When your Cous Cous is cooked add the Onion, freshly roasted Butternut, crumbled Feta Cheese and Parsley. To make the dressing, mix 4 Tablespoons Olive Oil with the juice of half a Lemon and a dash of Balsamic Vinegar. Add this to the salad and then adjust (you may find it needs more Balsamic) as needed. Top with some Pumpkin seeds or roasted Sunflower seeds if you have them.